A Salvadoran man reads a newspaper at a market in San Salvador on January 8. 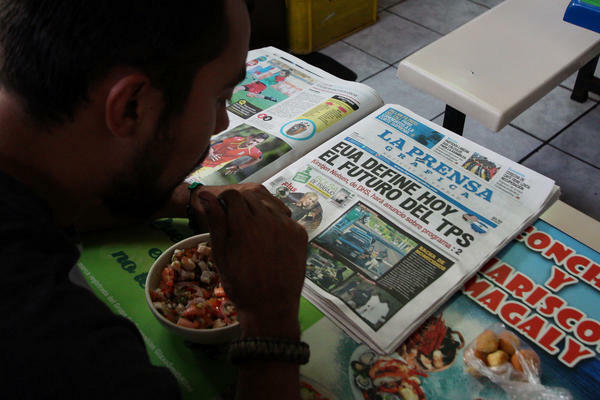 The newspaper headline reads: "The United States will decide today the future of TPS." Many immigrants from El Salvador are in a state of shock. On Monday, the Trump Administration announced that it will soon be ending a humanitarian program that has allowed nearly 200,000 of them to live and work in the U.S. since 2001, after two earthquakes devastated their country. Now they worry for their future. But the potential pain is likely to prove just as acute in El Salvador. That's because nearly all these Salvadoran immigrants work — and a huge share of them regularly send a portion of their earnings to family in El Salvador. Manuel Orozco, a political scientist with the D.C. thinktank InterAmerican Dialogue. Orozco has spent decades tracking these money transfers — or remittances as they're called — using government and financial firms' data as well as detailed surveys he's conducted. He estimates that about 150,000 Salvadorans with temporary protected status are sending remittances. On average each immigrant sends back $4,300 a year, says Orozco, for a grand total of more than $600 million annually. That's more than official U.S. aid to El Salvador — and it amounts to about two percent of El Salvador's GDP. If that doesn't sound like much, consider that the country's GDP has only been growing at about two percent a year over the last several years. Orozco says this means that, "in practical terms, if you were to stop this money, the economy couldn't grow." But he says even that statistic doesn't quite capture the impact. Most significant is his finding that about 1 in every 20 households in El Salvador depends on these remittances to get by. Take Edyt Mendoza de Urqilla and her husband. She's 58. He's 62. They grew up poor in a small town. She was only able to study through eighth grade and is a homemaker. He works as a security guard, earning $300 a month. So they were already struggling when the 2001 earthquakes hit. "Our house was totally flattened. We lost everything," she recalls. Fortunately for them their eldest child — a son — was in the United States at the time. He was there illegally and not earning very much. But then U.S. officials decided that — in consideration of the earthquakes — they would exercise their discretion to extend "temporary protected status" — or TPS — to unauthorized Salvadoran immigrants like de Urqilla's son. So he was able to get a work permit. And this in turn, allowed him to land a better paying job remodeling bathrooms in Gaithersburg, Maryland. Soon he was helping his parents cover the cost of a modest new house in El Salvador. "At first he was sending us about $50 a month to help us pay it down," says de Urqilla. "And he's just given us $8,600 to pay off the remaining debt on it completely." While TPS was originally granted to Salvadorans for just 18 months, successive presidents have repeatedly extended it. Trump administration officials say they deemed it appropriate to terminate the protection because El Salvador has now fully rebuilt from the earthquakes. This is a departure from the reasoning employed by previous administrations — which held that El Salvador remains unable to re-absorb the TPS holders due to other conditions that have worsened since the earthquake, such as drought, poverty and gang violence. Mendoza de Urqilla would agree. She says the money her son sends — about $500 a month, is still just enough to tide them over. All the more so now that her husband has retired and is down to a pension of $190 a month. "The salaries here don't even cover our cost of food — let alone hospital costs when you get sick," she says. She does have three other adult children in the U.S. But they haven't been able to contribute as much because they arrived after the earthquakes and are in the country illegally — so they make less. Orozco says this is frequently the case for Salvadoran immigrants in the U.S. illegally. On average, Orozco finds, they send about 5 percent less in remittances per person compared to Salvadoran immigrants who have TPS. What will happen now that Mendoza de Urqilla's son is set to lose his work permit too? It's hard to say at this point. The administration has set September 2019 as the termination date for TPS for Salvadorans. But it has also explicitly suggested that Congress might wish to intervene to extend permanent legislative protection to the affected immigrants. Orozco also estimates about a fourth of the TPS holders have U.S.-born children — many of them adults. So at least some of these children might be able to find a way to sponsor their parents for eventual legal status. Mendoza de Urqilla says she's still uncertain how her family will cope. "I'm so stressed out right now," she says. "For my son. And for myself."